This is a re-release of the 1982 double album documenting live material over several years. However‚ in this version the old album has been bulked up and contains 16 additional tracks. Disc one includes live performances from 1977-1979 and disc two delivers pieces of the Remain in Light tour of 1980-1981. Basically‚ this is a good original album made better (if one can believe it). The sound of the band is rough and definitely does not have the polish of Stop Making Sense (the other live album). David Byrne's voice cracks and bounces out of key‚ and at the same time the music remains simple and deliberate. However‚ throughout‚ the listener is constantly reminded that this band wrote great songs (i.e.‚ "Don't Worry About the Government" and "Big Country"). Things get a little more flamboyant in disc two‚ which is Talking Heads as ten-person band. 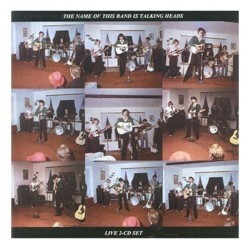 Overall‚ The Name of This Band is Talking Heads is really an album for the fan. That is another feature that makes it so great. When so much music is re-manufactured for no better reason than milking profit potential‚ this one comes off different. It comes off as a favor from the band and Rhino records to the fans of Talking Heads.